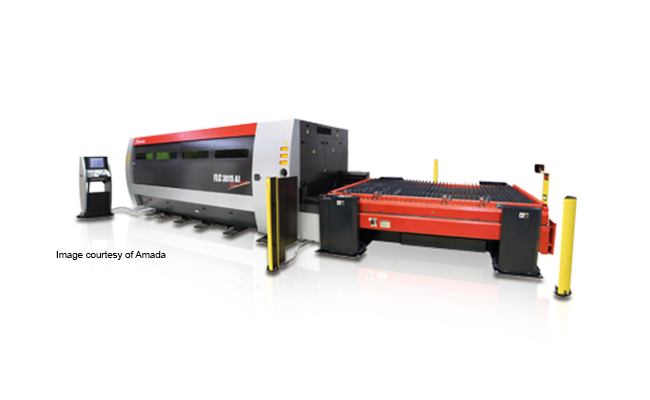 The FLC-3015 AJ laser cutting machine is a new, highly efficient and versatile CNC laser machine from Amada. The output power of 2k Watts from the AJ fiber laser allows very high machining speeds with getting high precision results at the same time. This CNC laser cutting machine is precise, reliable, and quick at handling thin sheet of sheet metal like aluminum, copper, and titanium. The FLC AJ series features a working area of 3000 millimeters x 1500 millimeters and the machine's table can hold sheet metal sheets up to 920kg of weight. The machine is very versatile and can perform tasks that are complex and can do them for long periods of time without user intervention. The laser machine is compact while providing optimum access and allows the short paths of travel. There is a high level of safety and operates very easily. The unique cast frame from this sheet metal cutting machine prevents the need of any a special machine base since its structure has a lower center of gravity. When you are using a laser CNC machine like this, you should use the CAD/CAM sheet metal software from Merry Mechanization called SMP. SMP delivers optimized NC code for laser machines like the FLC-3015 AJ from Amada.